We can save your hardwood floor! If your home suffers a water loss and your hardwood floors become affected there could still be the opportunity to save them! At Incredible Restorations, we keep up to date in the latest drying equipment available and some of that equipment in our inventory is specially designed to extract water from affected hardwood floors and dry them in place in attempts to restore them. This in-place floor drying system allows us to save homeowners, insurance companies, and property managers thousands of dollars in repair and replacement costs. This system extracts water from every crevice in any installed hardwood floor, avoiding the need to tear it up and replace it. 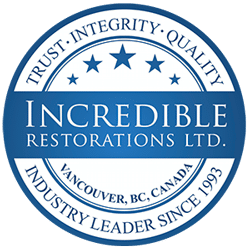 At Incredible Restorations we have dealt with hundreds of homes and businesses flooded by human negligence, storm damage, or plumbing mechanical errors. Our water damage restorations experts are experienced technicians able to detect the water source and rapidly clean up the water loss to minimize further damage for your property. Call Incredible Restorations immediately, we are available 24/7 to assist you with emergency water floods caused by appliance leaks, prepared with the knowledge and state-of-the-art infrared detection tools to rapidly mitigate the issue.